Antique American flags in the Betsy Ross Pattern, consisting of a single wreath of 13 stars, are much more scarce than most people realize. The legend of Betsy Ross sewing the first American flag gained widespread notoriety around the time of the American Centennial, when Betsy Ross' great grandson perpetuated the myth. However no documentation exists that ties this particular pattern of stars to a flag manufactured by Betsy Ross herself. Betsy Ross' granddaughter, Rachel Albright, and her great-granddaughter, Sarah Wilson, further perpetuated the style as that originating with Betsy Ross when, in the late 19th and early 20th century, they took up shop in Independence Hall in Philadelphia and made small hand-sewn silk flags in this pattern, signed by them, as souvenirs. Widespread manufacture of American flags in this pattern, though, did not take place until the time of the American Bicentennial celebration in 1976. It's likely that less than one percent of surviving antique 19th century and early 20th century antique American flags with 13 stars are in this pattern. Most are in the 3-2-3-2-3 pattern, followed by the 13-star medallion pattern. This particular flag is interesting on several counts. Its stars are double-appliqué, with ten of the stars (each side) being crudely hand-sewn, and three of the stars being machine sewn with a fine zig-zag stitch. The flag is somewhat large for the period, and the canton shows evidence of small holes in the wool. 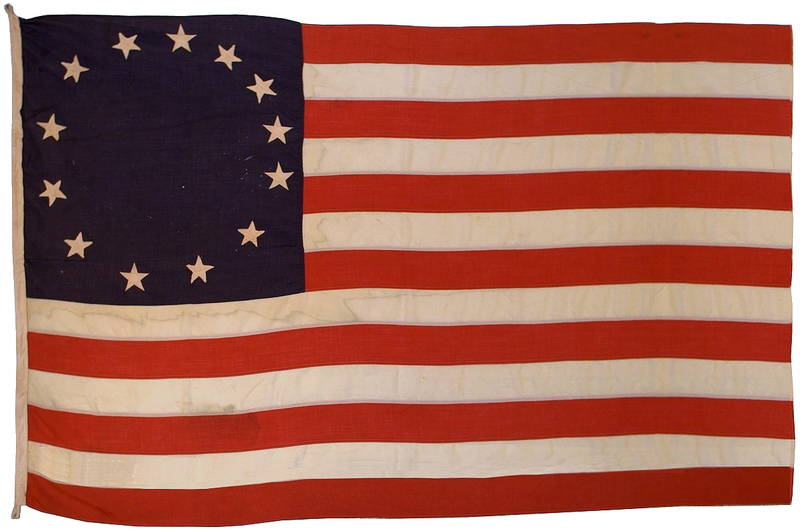 Overall, this clearly indicates that the flag was originally a full-count manufactured flag, perhaps in a star count of 45, 46, or 48, where the owner of the flag carefully removed the stars, leaving just three behind, and re-arranged the flag into the Betsy Ross pattern. The wreath itself is bold and beautiful, and slightly off-balance with the stars more densely arranged in the top-right quadrant than in the others. The stripes have mellowed to an off-white cream color. The original rope hoist of the flag remains intact. Because the zig-zag stitching on the remaining original stars is very high quality, compared to earlier circa 1890 zig-zag stitching, I suspect the flag was most likely a 48 star flag, which was converted to this pattern circa 1926, during the American Sesquicentennial, our celebration of the 150th anniversary of our independence. Americans tend to make and fly historic American flags most frequently during these times, as evidence also by the surviving flags made during the Centennial in 1876 and, most recently, the Bicentennial in 1976.